Directly across Elliot Bay from downtown Seattle is a finger of land called West Seattle that is the largest and oldest of Seattle’s neighborhoods and a vibrant community that is worth a days visit. Head toward the West Seattle Bridge and if you happen to be a passenger, enjoy the great views of the Port Of Seattle to the north and on a clear day, Mt. Rainier to the south while you cross the bridge and head toward the Admiral District. First stop, the Metropolitan Market. One of six locations in the Seattle/Tacoma area this is a grocery store extraordinaire. Not only is the store beautifully decorated and lit but the product line is high end and equally attractive. How many grocery stores have their own wine stewards to help you make selections, or a deli where you can order a complete prime rib dinner to go? Wander and be amazed, and pick up a few gourmet items for later in the day. Next head to the corner of California and Admiral for breakfast at Circa–a small, friendly restaurant that serves three meals a day and all of them are exceptional. You may have to wait a few minutes on the weekend, but chances are you won’t mind at all once you taste the offerings. From the over stuffed omelets, banana pancakes, or homemade coffee cake, one thing is for certain–you’ll leave happy. Afterwards take some time for a little shopping. Head south on California Avenue to the heart of West Seattle’s retail district. A unique aspect of the area is that parking is free, so pull into one of the lots the merchants have set aside for customers and begin to explore the two blocks of unique shops in The Junction, as it is called. Starting at the north end, stop in the Antique Mall, with offerings on three floors from many different dealers. You’ll find furniture, collectibles, and even vintage clothing. Friends and Company is a great little shop for scrapbookers, stampers and card makers. There are great paper supplies, stamps, stickers, and even kits. Classes are offered should you want to sign up for one. Cross California Street and drop into Capers, a home decorating store with lots of fun and interesting merchandise. A few doors down you’ll find Next to Nature, a pet store to satisfy any animal lover. Don’t forget to go to the very back of the store where local rescue cats are up for adoption and keep your eye peeled for the store cat, you’ll find him happily sleeping in the most comfortable place available. Just south of Next to Nature are two used book store, Leisure Books and Pegasus Book Exchange. Both take exchanges of used books and offer credit for buying books. It’s a great deal for readers and both shops have a large, ever changing selection. Just south is the intersection of California and Alaska. Take a peek in Easy Street Records for new and used CDs, and then wait patiently for the light to change and “Walk All Ways”. This unusual intersection allows pedestrians to walk any direction they desire, including diagonally, across the street. Continuing south have a look at Funky Jane’s Consignment Shop which carries high end, gently used apparel or Northwest Art and Frame which has a great selection of art supplies, custom framing, and a terrific selection of cards and gifts. While shopping, keep your eyes open for another unique aspect of West Seattle: the murals covering the entire sides of buildings. There are 11 in all, depicting various scenes of West Seattle history. Found everywhere from on the side of the Post Office, to the Washington Mutual Bank at Oregon and California, and at Alaska and California. If your breakfast has started to wear off or you’re ready for a snack, stop into Husky Ice Cream and Deli for a cone, a made to order sandwich, or some munchies. The Husky deli is very popular for lunch or a quick dinner and is packed for ice cream on a hot summer day. There’s lots of shopping to do in West Seattle but this area has what most other neighborhoods do not– it’s very own beach and the best views anywhere in the area. Hop in the car, take Alaska Way and follow the signs to Avalon Way and head to Elliot Bay to the east. Park somewhere near Seacrest Park and you will find a view of downtown Seattle that is postcard perfect. Get out, do some walking and take some pictures. Go out to the end of the pier, check out what the fishermen are hooking, and take in the water front, the Space Needle and the downtown skyline. There is no other view like this in all of Seattle. When you’re done watching the scuba divers and boaters, drive further north, until you arrive at the business district called Alki Point. This is where the first European settlers landed and met up with the local Native Americans. Here you’ll find a wonderful beach and lots of people sunbathing, playing volleyball, rollerblading, and parading with their dogs and kids. Relax, take a walk, people watch, and catch a few rays. The views of the mountains are great and the sunsets are amazing. When it’s time for dinner there is no better place then Duke’s Chowderhouse, right across the street from the beach. If it’s open, try the patio upstairs where you can enjoy the view while you dine on fresh seafood and their award winning chowder. There is no such thing as a bad meal at Duke’s and the drinks are really good too. 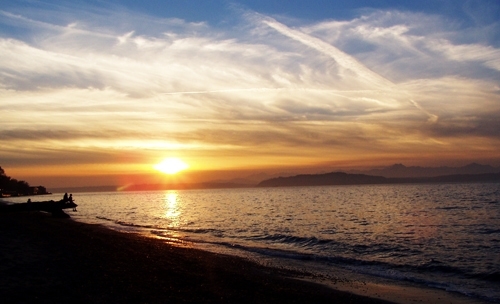 Once you’ve watched the sunset on Alki your last stop is the nighttime skyline of downtown. You’ll need to take a few more pictures because this is a view you will want to remember. West Seattle has a lot to offer visitors, come back any time or buy a condo and start calling it home. Getting There: Take I-5 or US 99 and follow the signs to the West Seattle Bridge. If Once across, take the Admiral Way exit to the West Seattle area known as the Admiral District.